Goodwood has confirmed that 22 Formula One legends will be in action at this year’s Festival of Speed, with no less than seven former world champions in action on the famous hill. 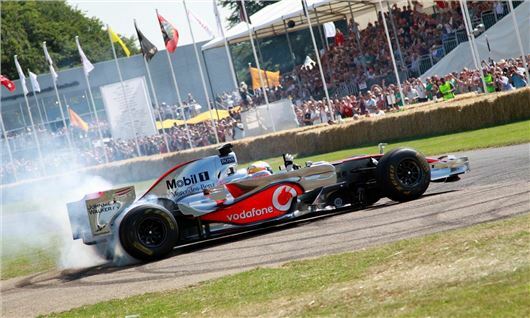 The 2014 Festival of Speed theme ‘Addicted to Winning’ has attracted a huge array of driving talent and some of Formula One’s greatest names will be in action on Goodwood Hill, with Lewis Hamilton, Jenson Button and Damon Hill all confirmed to take part. Emerson Fittipaldi, Sir Stirling Moss and John Surtees will also be rolling back the years and taking to the track in a variety of historic machinery. As well as a fantastic collection of Formula One drivers, the Goodwood Festival of Speed will also have some special guests from World Rally, Indy Racing and Le Mans. Goodwood regular and five-time Le Mans winner Derek Bell will once again be attacking the hill in his choice of Bentleys, while Al Unser, Kenny Brack, Gil de Ferran and Dario Franchitti will be leading the Indy 500 group. Meanwhile, on the purpose built rally stage, Sebastien Loeb, Hannu Mikkola and Jean Ragnotti will be in action, with a stunning collection of Audi quattros and Ford Escorts. Other notable names taking part in the action include Olympic hero Sir Chris Hoy, who will be swapping his cycle for a Nissan GTR GT3.